For this reason we have selected six frameworks that although they have been on the market for a few years but we believe that they have enough potential to continue increasing positions in the coming years. Close to Angular technology developed by Google, ReactJs differentiates itself from other Framework by its so-called MVC (Model View Controller) architecture. Component-oriented, ReactJs is a much less procedural framework than others. In particular, it makes it possible to interact with users and thus to offer a more efficient final tool with a reduced response time and load. 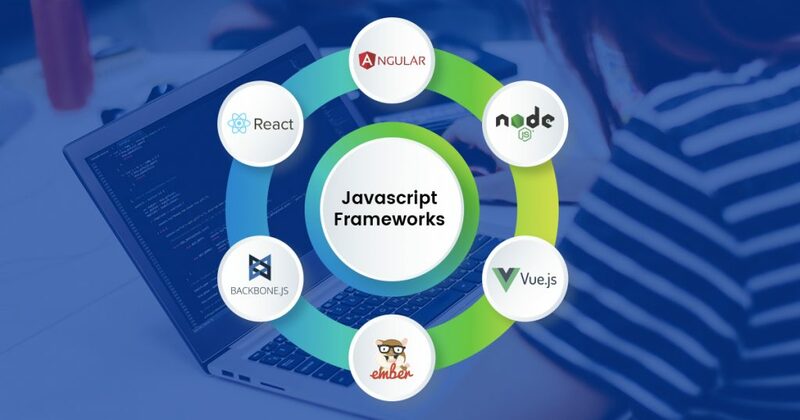 Indeed, the Web page generated thanks to ReactJs being organized in the form of blocks of components which control their own state, during the interaction of the end user with the page, if for example a modification has been made, only the component impacted by the change will be refreshed. If you have large web applications and above all that have dynamic content, probably React JS is a good alternative. It is a library that simplifies the creation of interactive user interface, in addition to providing a high degree of reliability. Being endorsed by the giant of social networks it has a large community that grows on a par with its popularity among developers. Not for nothing brands like Instagram, Uber and PayPal usually use it. React JS also allows to use HTML code; compress the components of an app into a single file; and manage changes over time without the need to reload the page, among other advantages. On the other hand, it has the peculiarity that it can be used in combination with other JS frameworks such as Angular and that it processes both customer data and those related to the server side. As for its architecture, it is based on components that operate under a one-way binding technology. Its DOM is virtual, which helps developers to have a very extensive database, while its learning curve is relatively low. Choose React if you are looking for a reliable, intensive and comprehensible framework to manage dynamic content. AngularJS is a framework for developing web and mobile sites and applications. Remember what a framework is it is a set of tools, modules, conventions that can lay the foundations of a program. It could be compared to a large empty but structured shell that allows you to design your project while respecting an imposed syntax. There are several but all aim to simplify the lives of developers, optimize their lines of code. Their development becomes more efficient, faster and safer. The developer can no longer code in a haphazard way. Since two years, AngularJS is in full progression. The fact that Google wears it is a reason. This framework is particularly powerful to make websites and web applications more enjoyable. It is an excellent choice for creating complex and varied visual elements and for beautiful graphic animations. It allows to design fluid and fast navigations in a “one page” context by greatly reducing the number of accesses to the server! This advantage puts it in first position for the development of web applications for mobile devices (smartphones, tablets etc). Why? Because the loading time on these media is longer than on a computer with a conventional internet connection. In addition, platform developers are trained by Google’s dedicated engineers. This guarantees performance, scalability and security. The use of Node as a web server also makes it capable of processing a large volume of requests simultaneously efficiently. This high performance is mainly due to its asynchronous design to avoid expectations. With Node, several queries can be made at the same time. No need to wait for a long action to finish to launch another one! As such, the online payment service PayPal, which adopted Node.js reported that its number of requests received per second had doubled and thus decreased the response time by 200 milliseconds, or by 35%. Node JS natively supports websockets that allow the implementation of responsive applications facing a large volume of queries to be processed in real time. With Node, the data transmission to the customer is automated: an action performed by a user has a direct impact on other users. In other words, as soon as new information is available, it is automatically made available. Take the example of a chat app. Instead of a page reloading automatically to show new messages the conversion is displayed in real time. Very useful to set up a chat with technical support in order to improve the service offered to the customer of an e-commerce. For example, Facebook chat and search engine are partially developed with Node.js. Companies facing the challenge of developing applications to respond to rapid changes are therefore particularly concerned by Node.js. Reactivity performance and ability to support a large volume of query without a dedicated server and make Node JS a technology to consider for the creation of an e-commerce. The feature most valued by developers is its progressive model and the simplicity to add or remove modules to your project and, even, to implement it with another project. The most basic template of this framework could be imported with a simple CDN link. A point also highly valued is that, unlike React, the templates are written with basic HTML. The Vue learning curve is relatively low, which allows you to start mastering this framework quite quickly, but if you have any doubts about its operation you can always access its resources section and additional documentation where you will find code examples and a community of developers that can advise you. Mention also that it has native versions to develop mobile applications, something that in a short time could be essential. Ember.JS makes a lot of choices for us. This is the famous philosophy convention over configuration close to the original Ruby on Rails framework. Whether at the level of roads, controllers, views and templates, Ember.JS follows a very strict and very intuitive naming convention that leaves no room for doubt about the responsibility of this or that component. It is also by this mechanism that is managed the creation of singletons and dependency injection. The classes to be injected are found by name and it is then possible to specify in which types of components (controller, router, etc.) they must be injected. Ember.JS relies on controller class names to link them to views and URLs. The convention is only about class names, but in practice most Ember.JS developers also use class names as filenames. It is often interesting to rely on a Seed project to start a project. Ember-App-Kit is one of these projects, which aims to structure its application code, its tests and its compilation of static files using the tools at the forefront. It includes Grunt, Less, Karma, PhantomJS and the ECMAScript 6 module system. In addition, Ember.JS encourages you to be consistent with your URLs and your interface. Indeed, following the Ember.JS conventions the nesting of the URL fragments implies a nesting of the views in the user interface. Ember.JS is for the moment more discreet than AngularJS on the Single Page Applications scene but it has undeniable advantages on certain aspects. By taking a resolutely object-oriented approach (in the classical sense of the term), it stands out from solutions like AngularJS which have instead bet on a procedural style. Its very deep observer pattern implementation, as well as the many other features built from above, allow it to bring disruptive functional and responsive programming paradigms into the world of front-end web development. Its purpose is to lay strong foundations for developing rich applications, without imposing an application structure. It wants to be non-binding compared to his rivals which costs him to be presented often as less complete. Its strong point is to be easily usable with other libraries or frameworks. Backbone.js is based on the Underscore.js library. The latter offers features for handling objects, collections and fairly advanced tables. For all that is DOM manipulation, rather than reinventing the wheel, the team in charge of Backbone.js decided to outsource this task to jQuery. It is possible to replace jQuery, for example with Zepto, as long as it respects the jQuery-compatible API. Backbone.js provides software components that can be used freely, whether with other Backbone.js components or with another library. The three most important are Model, Collection and View. We will also talk about two less important components but which provide very interesting features: Router and Sync. The use of each component is by extension of the class. During the extension, it is possible to reimplement the methods or to redefine the attributes and thus parameterize the object so that its behavior corresponds to our expectations. The documentation is very well provided on this point which happens to be one of the strong points of Backbone.js. Why Should You Choose ReactJS in 2019?